This summer, Wild Trails took other pupils from my school to South Africa for a fantastic trip that I will never forget. We learnt so much about animal conservation, poaching and endangered species, and we also learnt about cultures that were very different from our own. I believe that I gained more confidence because of the amazing experiences and activities we did. This has helped me in situations back home and I also believe that going to South Africa has made me think and act differently to how I did before. I can't thank Wild Trails, Angus and the other leaders enough as without them, I would never have been able to have this wonderful experience. What did Africa mean to me? This trip meant more to me than I am capable of describing. It was life-changing. It has changed my outlook on the way I treat others, my environment and myself. It opened my eyes to a need that's greater than mine and it allowed me to learn just how privileged I am. Being able to learn about other cultures by being there and asking questions and seeing it first hand is an experience that I find hard put into words. All I can say to you is that to understand Africa you need to go there. This trip helped me grow and change as a person and it continues to keep me focused everyday. It is well worth the cost and I can't thank Angus and Tommy enough for all their hard work to make sure this trip went well. It sounds cliche, but before going I struggled with my confidence and found myself being dependent on others to feel comfortable. Three weeks in South Africa helped me to become the person I am today! I am so grateful to everyone who was part of the trip and still talk about it to new people I meet. After that trip to South Africa, I studied a Foundation Degree in Animal Science. I am now currently training to be a Biomedical Scientist, after graduating from Brighton University with a degree in Biomedical Science. Although this is a step away from the animal background, I have no doubt in my mind, I wouldn't be where I am had I not been offered the opportunity by Angus a few years ago. I cannot thank Wild Trails enough...! 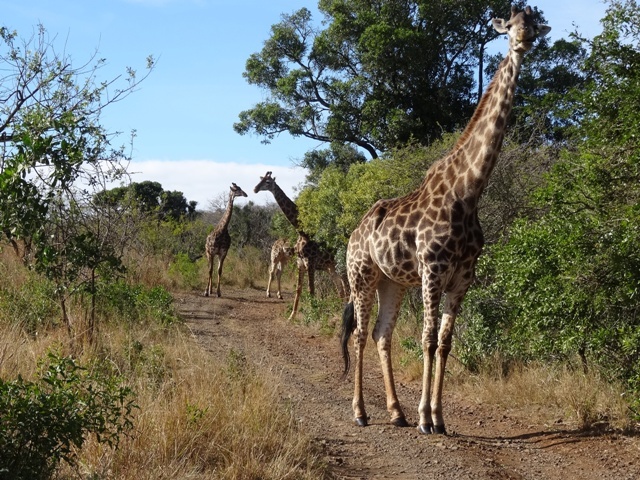 The July 2014 tour to South Africa was a real eye opener for me. I was stuck in a personal place that would have only have got worse but with the help of Africa Wild Trails I am now in Plumpton College studying a BTEC2 Course in Animal Care. I learnt so much on the tour to South Africa such as wildlife conservation, endangered species, Rhino conservation and the history of poaching. My trip to Africa will stay in my heart for the rest of my life, it was the most incredible experience for me. Being so far from home, never having experienced anything like it before, I was very nervous and shy - I overcame a lot personally in ten days and I really made myself proud. It changed the way I saw and felt about myself as a person, It made me believe in myself more and my confidence grew quickly. Even now (it’s been about two years since we got back) it still feels very close to me and I would love to do it again. What an amazing thing to do, I think everyone should get the chance to experience it! When I went to South Africa back in 2012 I had the best time of my life. I learnt a lot about myself and how to work as a team. I did things that I thought I'd never do. Angus Wingfield and his guides pushed me do things I didn’t think I would be able to do. We travelled loads and walked up mountains, we camped in the middle of the bush, we visited an orphanage which was heartbreaking. Learned different kinds of culture. I had the best experience of my life. If it wasn't for Angus I don't think I would ever go there. So, thank you, Angus. For me South Africa was a really important experience because it opened my eyes to an entirely different environment and way of life to anywhere I've been before. I'd say that meeting so many interesting and passionate people out there really helped improve my perspective and approach to life, especially as I was quite apprehensive about meeting people before going. I found it pretty challenging, but actually hugely rewarding and an enriching experience. The trip has actually had a huge impact on my decisions for what I want to do later in life, as since I came back from the trip I have decided not to apply for Architecture at Uni, instead I have just applied for International Development, with a view to spend my research year in South Africa. I now have an unconditional offer..!! My experience in Africa changed my life so much, I came back a stronger and more determined person I felt like I could accomplish anything I set my mind to. It was a once in a life time opportunity for me and I will never forget it. When I was in Africa I learned so much about wildlife conservation I didn't know about before. I also loved their culture and I met some amazing people over there, everyone was so welcoming I just really did have an amazing time. What I learnt about myself in Africa 6 years ago I still use today. If I get set a challenge I go for it 100% now because I know I'm capable of anything I set mind to, where as before I probably wouldn't have tried. It has changed my life so thank you so much for giving me that opportunity all those years ago, I could never repay you for what this has done for me. Since I left college, I've always had a dream of working with animals. Last summer I contacted Africa Wild Trails and met Angus the director of the organisation. The meeting was very professional and delivered the best experience up to date and the programme that was arranged for me exceeded my expectations. The people that I met, the places I have been and the things I have done have been amazing. The two months I spent in South Africa was hard work, amazing fun, educational and enlightening. I have done so many things I could never have dreamt of doing, seeing the Big 5 face to face on a Wilderness Trail, seeing so many birds I have never seen before such as a Hornbill, Tiger Fish fly fishing, kayaking on Tugela and Pongola rivers, mountain biking in the bush, hiking, snorkelling in the rivers and sleeping out in the wild under the stars, surrounded by Baboons, Lions, Rhinos, Buffalo, Elephants and more. Thank you to Angus Wingfield and the Wild Trails team. I first met Angus in 2013. Since then we have worked together on my companies Invictus Programme for disadvantaged young adults in the UK and undertaken an 8000km rally in Southern Africa in aid of rural school children. Angus’ understanding of Southern Africa and South Africa in particular, is second to none. His attention to detail and logistics, health and safety, risk management and connections with the right people on the ground, ensure that travelling with Africa Wild Trails is an experience you will never forget and, one that will live with, and inside you, for many years. Angus’ patience, integrity, insight, and understanding of what they are going, and have been through, results in them connecting not only with the physical experience of spending time in Africa. Angus’ passion for conservation, people and education is an incredibly powerful combination, and one that can, and does, transform lives. 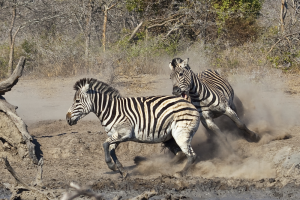 Africa Wild Trails' offers a range of truly unique and inspirational experiences. My Daughter was lucky enough to go on one of them and found it to be a truly life-changing experience. Even now we like to look at the exiting trips on offer and hope to go on one together soon. I would highly recommend 'Africa Wild Trails' to anyone thinking of visiting Africa especially for the first time. The experienced and professional staff will soon have even the most nervous travellers soon feeling at ease. Going to South Africa was a life changing experience, and I'm not just saying that to fill up space; I went there unaware of what I was getting myself into and Left wanting more. Being out there welcomed me to a new world that I didn't know existed, one that I felt I belonged in. Being around the wildlife drew me closer to nature, somewhere I've always believed I should be, but never knew how to get there. Everything I did out there: tracking, hiking, paddling, all of it was phenomenal and only made me want to stay longer. I can't thank Angus and his team enough, and everyone out at the camps who made the experience unforgettable and who taught me things I can't get to learn in the big city. The summer of 2017, I got to experience the amazing culture of South Africa, on this trip I was able to learn about the way people are brought up and the way they live their lives. My favourite part of the trip was when we went to Ntokosa school. On Tuesday, the 8th of August, myself alongside 20+ cadets and adult volunteers set off on a hike up what seemed to me like a mountain! 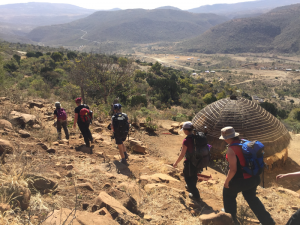 Our goal was to get to the plateau at the top where a school called Ntokosa awaited our arrival. After 3 hours of hard trekking, we arrived where the kids greeted us is the most fantastic way you could ever imagine. They sang a bunch of songs for us and it was an overwhelming experience to be a part of. Then came the serious part, two sports match happened a 5-5 football draw which was a fun thrilling game and also a netball game where the Cadets beat the African girls! Overall it was full of amazing experiences that will stick with me for the rest of my life. My trip to South Africa in 2016 with Africa Wild Trails will stay in my heart and soul forever. I had the pleasure of working with Angus on a trip with the amazing young people that I work with. This was an educational and experiential tri on so many levels not only for the young people but also myself, and I feel so privileged to have been a part of it. I had absolute confidence in Angus' leadership, especially with guiding of young people through the settings that saw them so far out of their comfort zones, both physically and mentally. The stand out part of the tour for me has to be watching our young people meeting the children at the Ntokozo school, where cultural and language barriers seemed to disappear in the pure enjoyment of the here and now and of meeting each other. The entire tour was extremely well facilitated and organised, and I hope I have the chance to work with Angus again in the future. AWT CORE WORK is the planning and delivery of diverse and challenging international ventures, expeditions and wildlife conservation fieldwork for youth and adult groups in some of the world’s most stunning locations. Personal growth, wildlife conservation, environmental awareness and community engagement are component parts of the ethos that underpin all our international ventures. AWT IN COUNTRY FACILITATION means groups are Personally Guided by qualified field experts | Drivers and vehicles are of the highest standard | Catering for all dietary requirements | Accommodation to suit every brief. AWT GROUP MEMBERS The planning and delivery of all our venture are based around your brief to us. As such we will work to the fitness and skill level of your group. 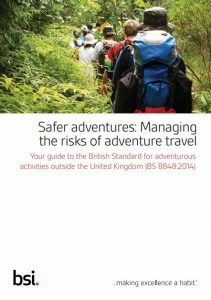 Pre-departure preparation and training can be available for all groups to ensure everyone is ready for their adventures when you arrive in country.